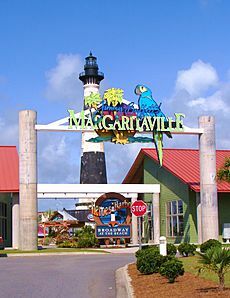 Myrtle Beach /ˈmɜːrtəlˈbiːtʃ/ is a coastal city on the east coast of the United States in Horry County, South Carolina. It is situated on the center of a large and continuous stretch of beach known as the Grand Strand in northeastern South Carolina. Myrtle Beach is one of the major centers of tourism in the United States because of the city's warm subtropical climate and extensive beaches, attracting an estimated 14 million visitors each year. As of the 2010 census, the population of the city was 27,109 with the Myrtle Beach metropolitan area population at 465,391 according to a 2013 estimate. A man-made island, Myrtle Beach has been separated from the continental United States since 1936 by the Intracoastal Waterway, forcing the city and area in general to develop within a small distance from the coast. In part due to this separation, the area directly west of Myrtle Beach across the waterway remained primarily rural, whereas its northern and southern ends were bordered by other developed tourist towns, North Myrtle Beach and Surfside Beach. Since then, the inland portion of the Myrtle Beach area has developed dramatically and the beach itself is developing westward. According to the United States Census Bureau, the city has a total area of 23.55 square miles (61.0 km2). According to the Köppen climate classification, Myrtle Beach has a humid subtropical climate or Cfa – typical of the Gulf and South Atlantic states. The city enjoys abundant sunshine year-round with more than 2800 hours annually. Myrtle Beach is protected from erosion by vegetation-filled sand dunes. The summer season is long, hot, and humid in Myrtle Beach. Average daytime highs are from 83 to 91 °F (28 to 33 °C) and average night-time lows are near 70 °F (21 °C). The coastal location of Myrtle Beach mitigates summer heat somewhat compared to inland areas of South Carolina: Thus, while nearby Florence averages 65 days annually with high temperatures of 90 °F or higher – Myrtle Beach averages only 21. The Bermuda High pumps in humidity from the tropical Atlantic toward Myrtle Beach, giving summers a near tropical feel in the city. The warm Atlantic Ocean reaches 80 °F or higher in the summer months off Myrtle Beach, making for warm and sultry summer nights. Summer thunderstorms are common in the hot season in Myrtle Beach, and the summer months from June through September have the most precipitation. In summer, thunderstorms normally build during the heat of the day – followed by brief and intense downpours. Myrtle Beach has mostly mild winters of short duration: Average daytime highs range from 57 to 61 °F (14 – 16 °C) and nighttime lows are in the 36 to 38 °F (2 – 3 °C) from December through February. Winter temperatures vary more than summer temperatures in Myrtle Beach: Some winters can see several cold days with highs only in the upper 40s F (7 – 9 °C), while other winter days can see highs in the upper 60s and low 70s F (19 – 23 °C). Myrtle Beach averages 33 days annually with frost, though in some years less than 15 days will see frost. Snowfall is very rare in Myrtle Beach, however a few times every 15 or 20 years a trace of snow might fall. In February 2010, a rare 2.8 inches (71 mm) of snow fell in Myrtle Beach. The spring (March, April and May) and fall (September, October and November) months are normally mild and sunny in Myrtle Beach, with high temperatures in the 60s and 70s. 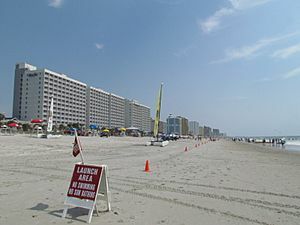 The beach season in Myrtle Beach normally runs from late April through late October. SST (Sea Surface Temperatures) are often in the lower 80's (26 – 28 °C) off South Carolina in summer and early fall. Summer thunderstorms can be severe, but are brief, but tornadoes are rare in Myrtle Beach. Tropical cyclones occasionally impact Myrtle Beach, though weaker tropical storms and weak tropical lows are more common. Like most areas prone to tropical cyclones, a direct hit by a major hurricane is infrequent in Myrtle Beach. The last hurricane to cause significant damage in Myrtle Beach was Hurricane Hugo in 1989. The worst hurricane in the history of Myrtle Beach was Hurricane Hazel in 1954. Hosting over 14 million visitors annually, the Grand Strand is home to an array of tourist attractions, and the area receives a large influx of visitors during all seasons. Nearly 100,000 visitors a year are estimated to come from overseas, with tourists from Canada, Germany and the United Kingdom. Myrtle Beach hosts a variety of special conventions, events, and musical concerts. The area's attractions include its beaches and courses, as well as a number of amusement parks, an aquarium, Legends In Concert, retail developments, a number of shopping complexes and over 1,900 restaurants including seafood restaurants. The area also has dinner theaters, nightclubs, and many tourist shops. 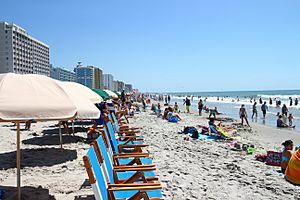 Myrtle Beach has an estimated 460 hotels, with many on the beachfront, and approximately 89,000 accommodation units in total. Also in the city is Myrtle Waves, one of the largest water parks on the East Coast of the United States. The Carolina Opry is another highly acclaimed attraction, which features various musical, comedy, dance, and entertainment shows, including the Carolina Opry (variety show), Good Vibrations (best of the 1960s, 1970s, and 1980s), Light—a Laser Extravaganza. During the holiday season, the venue hosts the Carolina Opry Christmas Special. It is housed in a 2,200-seat theater. The Myrtle Beach Boardwalk opened in 2010 and has been recognized as the nation's #3 boardwalk by National Geographic and one of the best US boardwalks by Travel + Leisure magazine. The Myrtle Beach Skywheel opened at the boardwalk in May, 2011, and is a 200-foot (61 m) observation wheel, similar to a ferris wheel, with glass gondolas that look over the Atlantic Ocean. This is the first wheel of its kind in the U.S. Myrtle Beach State Park, established in 1935, has just under a mile of Grand Strand beach and is a prime location for camping, swimming, hiking, biking, and fishing. The Myrtle Beach Convention Center is a large facility that hosts a variety of meetings, conferences, exhibits, and special events every year. The expansive center, which opened in 2003, has a Sheraton hotel and resort. Myrtle Beach welcomed Hard Rock Park in 2008, which was themed after the popular Hard Rock Cafe chain. After financial issues, the park became Freestyle Music Park for the 2009 season. The park features attractions themed after various genres and eras of music, such as the British Invasion. The park did not open for the 2010 season, and continues to be closed due to having been engulfed in legal issues. As of 2014, the park has been closed and is being dismantled. Each March since 1951 during Ontario's spring break, Myrtle Beach has hosted Canadian-American Days, also known as Can-Am Days. Tens of thousands of tourists flock to the area for a week's worth of special events. Myrtle Beach is also home to Coastal Uncorked, a food and wine festival held in the late spring annually. In June, recently graduated high school seniors come to Myrtle Beach for Senior Week. With numerous professional fireworks displays along the oceanfront, Myrtle Beach is recognized among the top destinations for Fourth of July travel. Priceline.com ranked Myrtle Beach among its top 20 destinations for Fourth of July in 2010. The majority of visitors make their way to the region during the high season (June–August) looking to make the most of its fine weather. Although gambling is not legal in South Carolina, Myrtle Beach residents and visitors have easy access to gambling by boat, as passengers can travel into international waters beyond the reach of federal and state gambling laws. The city and surrounding area is served by Myrtle Beach International Airport. With regular flights to and from destinations such as Atlanta, Boston, Detroit, Fort Lauderdale, New York and Washington, the airport itself is well connected for both domestic and international tourists visiting the region. The airport also serves as a seasonal gateway to and from the likes of Chicago, Dallas and Toronto. 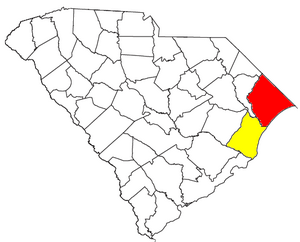 The city is located between Wilmington, North Carolina and Charleston, South Carolina with U.S. Route 17 serving as the main transport link for those journeying from the north and south. Riders in traffic at the 2008 Atlantic Beach Bikefest. Myrtle Beach Bike Week, also called "Harley Bike Week" is a week-long motorcycle rally first held in 1940, the same year Kings Highway was paved. The event has attracted as many as 200,000 visitors to the city every May. Black Bike Week, founded in 1980, takes place the weekend around Memorial Day Weekend and is the largest African American motorcycle rally in the US and attracts as many as 400,000 visitors. The event was created in response to a history of discrimination against African-American visitors and riders to Myrtle Beach and the Grand Strand Area. The Myrtle Beach government created 15 new laws aimed at preventing all sanctioned motorcycle events within the city in response to controversy including accusations of racism by African-American riders during their event and complaints of lawlessness and poor behavior during all highly attended events. Several lawsuits by the National Association for the Advancement of Colored People (NAACP) against Myrtle Beach businesses were settled with agreements that discrimination cease, compensation be given to some plaintiffs, and employees be given diversity training. 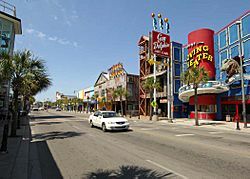 The NAACP suit against the City of Myrtle Beach was settled in 2006 without the city paying damages, but with the agreement police would use the same traffic control rules during both the black and the white motorcycle rallies. The South Carolina Supreme Court in June 2010 unanimously overturned one of the 15 ordinances, which had required all motorcyclists to wear helmets, on the grounds that the state law, requiring helmets only for riders under age 21, cannot be preempted by a city ordinance. In addition, the Court ruled, the ordinance created undue confusion, and that the city itself had invalidated their own helmet law and some other ordinances in a subsequent amendment. The law had been challenged by a group of motorcyclists and a group of Myrtle Beach businesses called BOOST, Business Owners Organized to Support Tourism, who opposed the city's anti-motorcycle tourism policy. Myrtle Beach Mall is 525,385 square feet (48,809.9 m2), and has three anchor stores, Bass Pro Shops, Belk and JCPenney. The single-story mall also has a 12-screen movie theater, a food court, and other specialty stores. It used to be known as Colonial Mall, and was built as Briarcliffe Mall. Tanger Outlets is a shopping outlet center. There are two locations, one near Briarcliffe Acres and one near Carolina Forest. Broadway at the Beach is a shopping complex set on 350 acres (1.4 km2) along the U.S. 17 Bypass surrounding the 23-acre (93,000 m2) Lake Broadway. It is the largest festival entertainment complex in South Carolina. Barefoot Landing is an outdoor shopping complex that consists of several divided sections located on filled land over top of Louis Lake, next to the Intracoastal Waterway. It contains many stores and attractions such as House of Blues and the Alabama Theatre. The Market Common is a lifestyle district housing several upscale retail and apartments. It is located on the site of the former Myrtle Beach Air Force Base. Prior to the arrival of Europeans, the Long Bay area was inhabited by the native Waccamaw Tribe. The Waccamaw used the river for travel and fished along the shore around Little River. 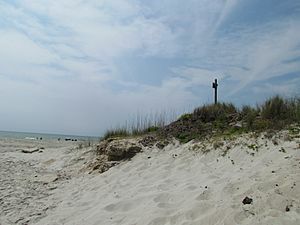 Waties Island, the primary barrier island along Long Bay, has evidence of burial and shell mounds, remains of the visiting Waccamaw. The first European settler along Long Bay arrived in the late 18th Century, attempting to extend the plantation system outward towards the ocean. Records are sparse from this period, with most of the recorded history pieced together from old land grants documents. These settlers were met with mixed results, producing unremarkable quantities of indigo and tobacco as the coast's soil was sandy and most of the crop yields were of an inferior quality. Prior to the American Revolution, the area along the future Grand Strand was essentially uninhabited. Several families received land grants along the coast, including the Witherses: John, Richard, William, and Mary. This family received an area around present-day Wither's Swash, also known as Myrtle Swash or the eight-Mile Swash. A separate grant was granted to James Minor, including a barrier island named Minor Island, now Waties Island, off of the coast near Little River. Mary Wither's gravestone at Prince George Winyah Episcopal Church speaks to the remoteness of the former Strand: "She gave up the pleasures of Society and retired to Long Bay, where she resided a great part of her life devoted to the welfare of her children." As the American colonies gained independence, the area remained essentially unchanged, and the coast remained barren. George Washington scouted out the Southern states during his term, traveling down the King's Highway. He stayed a night at Windy Hill (part of present-day North Myrtle Beach) and was led across Wither's Swash to Georgetown by Jeremiah Vereen. The Withers family remained one of the few settlers around Myrtle Beach for the next half-century. In 1822, a strong hurricane swept the house of R. F. Withers into the ocean, drowning 18 people inside. The tragedy made the Withers family decide to abandon their plots along the coast. Left unattended, the area began to return to forest. The Burroughs and Collins Company of Conway, predecessor of modern-day Burroughs & Chapin, purchased much of the Withers’ family land in 1881, and the growing community was called New Town around the start of the 20th century. A post office named "Withers" to serve the site of the old Swash in 1888. On February 28, 1899 Burroughs and Collins received a charter to build the Conway & Seashore Railroad to transport timber from the coast to inland customers. The railroad began daily service on May 1, 1900 with two wood-burning locomotives. 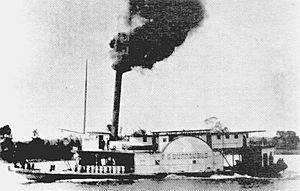 One of the engines was dubbed The Black Maria and came second-hand from a North Carolina logging operation. After the railroad was finished, employees of the lumber and railroad company would take train flatcars down to beach area on their free weekends, becoming the first Grand Strand tourists. The railroad terminus was nicknamed "New Town", contrasting it with the "Old Town", or Conway. Around the start of the 20th century, Franklin Burroughs envisioned turning New Town into a tourist destination rivaling the Florida and northeastern beaches. Burroughs died in 1897, but his sons completed the railroad's expansion to the beach and opened the Seaside Inn in 1901. Around 1900, a contest was held to name the area and Burroughs' wife suggested honoring the locally abundant shrub, the Southern Wax Myrtle (Myrica cerifera). The Withers post office changed its name to Myrtle Beach soon afterward. It incorporated as a town in 1938 and as a city in 1957. 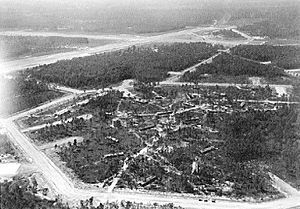 In 1937, Myrtle Beach Municipal Airport was built, however it was promptly taken over by the United States Army Air Corps in 1940 and converted into a military base. Commercial flights began in 1976 and shared the runway for over 15 years until the air base closed in 1993. Since then the airport has been named Myrtle Beach International Airport. In 2010 plans to build a new terminal were approved. In 1940, Kings Highway was finally paved, giving Myrtle Beach its first primary highway. The Myrtle Heights-Oak Park Historic District, Myrtle Beach Atlantic Coast Line Railroad Station, Ocean Forest Country Club, Pleasant Inn, and Rainbow Court are listed on the National Register of Historic Places. Also listed was the Chesterfield Inn, now demolished. Myrtle Beach is the largest principal city of the Myrtle Beach-Conway-Georgetown CSA, a Combined Statistical Area that includes the Myrtle Beach-Conway-North Myrtle Beach metropolitan area (Horry County) and the Georgetown micropolitan area (Georgetown County), which had a combined population of 329,449 at the 2010 census. 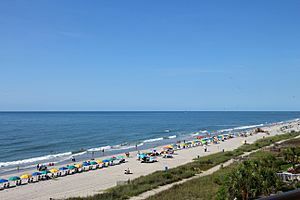 As of the 2010 census, the population of Myrtle Beach was 27,109. Per the 2000 census there were 22,759 permanent residents in Myrtle Beach, 10,413 households, 5,414 families, 1,356.5 people per square mile (523.7/km²), with 14,658 housing units at an average density of 873.5 per square mile (337.3/km²). 2.7% from two or more races. Hispanic or Latino of any race were 13.7% of the population. The per capita income for the city was $23,214. About 7.6% of families and 12.0% of the population were below the poverty line, including 17.1% of those under age 18 and 6.6% of those age 65 or over. The Market Common was once the location of Myrtle Beach AFB. Myrtle Beach, South Carolina Facts for Kids. Kiddle Encyclopedia.